A not insignificant portion of the national political establishment—consisting of panicky Democrats and Republicans alike—is hoping that Rick Perry’s commanding lead in recent Republican primary polls will wither under the lights of this month’s multiple presidential debates, beginning with tonight’s event at the Ronald Reagan Library in California. The governor of Texas may be a formidable retail politician, they reason, but as soon as he’s facing sustained, aggressive questioning, and is forced to speak off the cuff about policy, he’ll be exposed for what he truly is: A good ol’ boy who doesn’t have the brains or the manners to earn the public’s trust. This is, to put it mildly, wishful thinking. Anyone who’s counting on Perry showing up this evening and tripping over himself, in the style of George W. Bush, is in for an unpleasant surprise. Perry has occasionally been a lazy debater and he is sometimes lackadaisical about keeping informed, but he has cultivated a number of rhetorical strengths. On the issues where he has been motivated to mastery, for example, such as business and electoral politics, he typically has a commanding grasp of the facts. When I’ve interviewed him, I’ve been most concerned about economic issues, and have found him to be an articulate and nimble advocate for the Texas model, controversial though his views may be. Perry also has a natural facility for language. Jonathan Martin, at Politico, excavated a brilliant comment that Perry made about Karl Rove back in 1994. “My brain is like a chicken pot pie,” said Perry, “His is like a refrigerator that is all very organized—pickles here, salad there.” A chicken pot pie, perhaps, but a lot of professional speechwriters would struggle to come up with an image so apt and evocative. There is an illuminating comparison here between Perry and his predecessor, Bush. Both have a reputation for gaffing, but their missteps are different in type. Bush’s errors were typically of execution; he would simply misspeak, muddling his grammar or his quotes. Perry’s errors are typically of content rather than form. His most damaging comments to date have come in 2009, when he seemed to suggest that Texas might secede, and last month, when he said that if Ben Bernanke came to Texas, he would be treated “pretty ugly.” In both cases, the public objection was about the thought being expressed more than how it was phrased. And it’s safe to assume that both times Perry was not offering sincere policy proposals, just running his mouth: Texas is not authorized to secede, and the idea that Texans would consider doing so is ridiculous; and whatever your feelings about quantitative easing, it’s obviously not “almost treasonous.” In general, it seems that campaign gaffes are most costly when they seem to reveal something noxious or corroborate something that voters already dislike about a candidate. Perry’s trash-talking confirms that he’s aggressive, but Republican voters don’t particularly dislike that in a candidate. Of course, it’s thuggish to suggest that the Federal Reserve Chairman should be mistreated, but Perry knew that his remarks were unlikely to count against him. Liberals predictably wringed their hands, but the only effect has been to give Perry an opportunity to cite their outrage over his secession comments as a punch line at conservative rallies. None of this is to say Perry has an entirely sterling record as a debater. Political debates in Texas, as in most states, are seldom heavily scrutinized, but even so, Perry has been criticized for lackluster performance at times, and, on occasion, for not even bothering to show up. His showing in the 2010 Republican primary debate, facing Kay Bailey Hutchison, the state’s senior senator, and Debra Medina, a libertarian who launched an attention-getting challenge from the right, went particularly poorly. Under questioning from his rivals, the moderator, and the audience, he bristled and deflected. His manner suggested that he had blown off debate prep, and was coasting on the fact that neither Hutchison nor Medina was likely to beat him. The interviews and debates of the 2010 gubernatorial cycle, or the lack thereof, point to a substantive critique of Perry, one that his critics have neglected until now, and that deserves to be made more often. This is that he has shown a tendency to complacency—a lack of willingness to engage the other side, or to attempt to win people’s support when they’re not already inclined in his favor. It may be that in Texas he simply hasn’t had to: He has only rarely faced a serious challenge there. But even if Perry can easily win the primary, he faces a serious rival in Barack Obama. More importantly, if Perry wins the general election, the American president ought to at least aspire to an ethic of statesmanship, if only in his rhetoric. Yet Perry’s arrogance in addressing only part of the electorate is closely related to one of his greatest rhetorical strengths—namely, his irrepressible confidence. 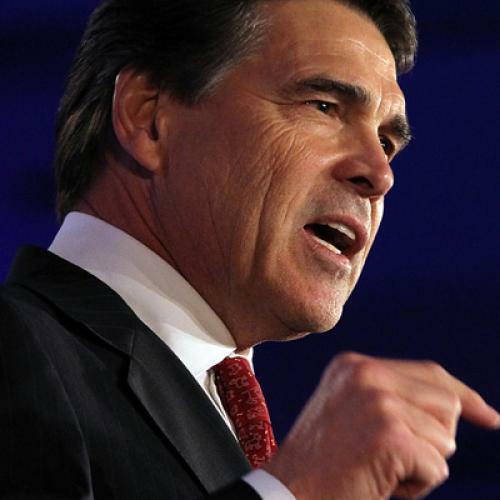 Where some people see hubris in Perry’s manner, many voters see in it an appealing fortitude. I was struck by this during a campaign rally last February, when Perry shared the stage with Sarah Palin. At that point, they were still very chummy, and they both clearly relished picking a political fight, but the contrast in their rhetoric was instructive. Perry campaigns against the background of an assumed electoral victory and political triumph. He styles himself as speaking for the voters who are “frustrated,” “fed up,” and ready to roll up their sleeves and get back to work. Palin’s invective trades instead on undiluted anxiety. In terms of good humor, he also easily exceeded her—and for that matter, Obama. The hope-heavy rhetoric of the President’s 2008 campaign contained a discernibly pessimistic streak, as when the candidate Obama warned that there is such a thing as “too late,” and that the moment was almost upon us. Since his election, Obama has also sometimes been distinctly snappish. That may be an inevitable response to the personal attacks and constant histrionics of national politics. Perry, of course, has not yet been exhausted by months on the trail, and it will be interesting to see how he holds up during what will be his most grueling race. In the early stages, however, his sunny side will serve him well. For his first debate, we can expect the other candidates to be on the attack against him. But we can also predict that he will be prepared, and will acquit himself more ably than his critics hope. Debating may not be Perry’s strongest suit, but in this respect, as in most, past rivals who have discounted Perry have done themselves no favor.